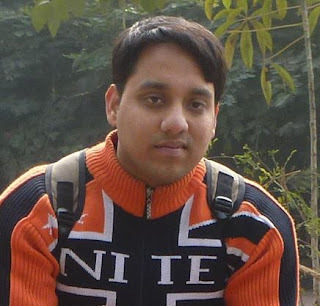 Today on Newbie Corner, we have Diwakar Pokhriyal, a young poet who shows immense potential if we go by the various awards and recognition his works have already garnered. Welcome to Newbie Corner Diwakar! Well, I am an enthusiastic writer, but not the trained one, I guess. I have completed my B.Tech and MBA in Energy. Currently pursuing PhD in Energy field. If that doesn’t go well with my writing experience then I must say that I have written my first Hindi short story when I was 14 years young and first poem at 15. I have written 12 books as of now and I am a part of 74 poetry anthologies with poets around the world. My writings are available in various websites. I have won various competitions, including ‘Poesies’ award for Literature – 2014’, and have given few interviews as an author. 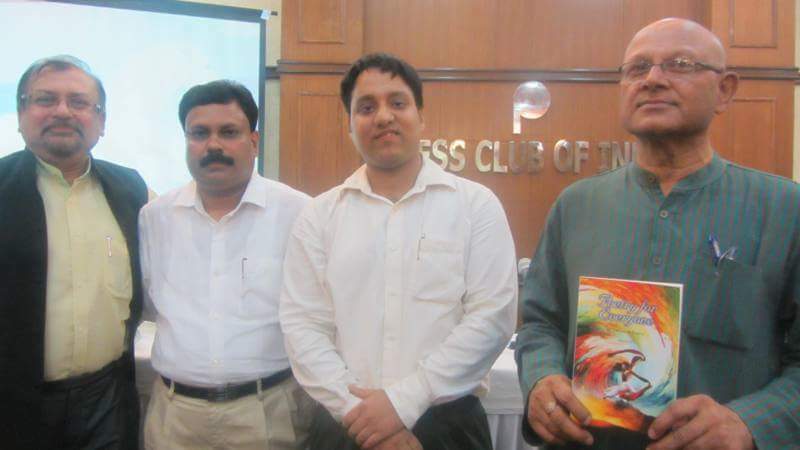 A book in which my poem is there is a part of Limca Book of Records-2015. When did I start writing? Two points will connect the answer of this question. The first point is when I have written my first short story during the age of 14, that was not so awakening because I wasn’t aware of the creativity and second is when I held my first published book and realized that dreams do come true. So during my school period of history and other boring subjects (from my perspective), I wrote 12 pages of a small notebook, but I didn’t take it as a serious thing. 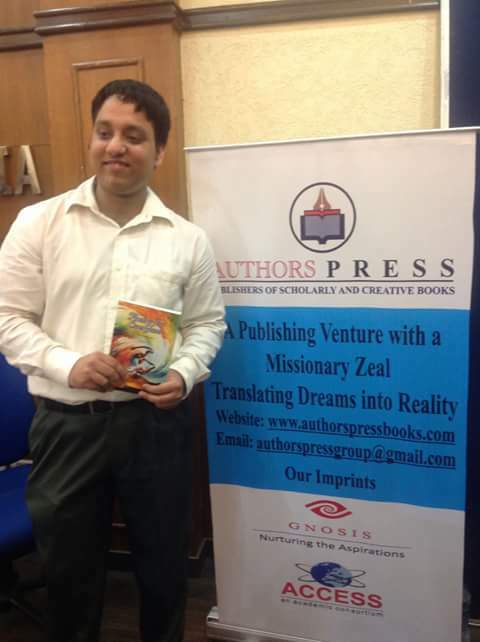 During my MBA after listening to the lecture about passion, my writing journey took another level and finally I went ahead with my first poetry book for publishing. Poetry is my favorite and will always be, I guess. Writing poetry is so fun. 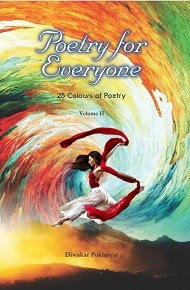 With my recent books Poetry for Everyone 1 & 2, it had become more fun. In those books I have written about 50 different forms of poetry. Mostly the poetry gets covered up with rhyme and free verse. Few people here and there will talk about Haiku and tanka, but nobody discusses about different forms of poetry. As a poet, who knows which form will appeal a certain individual? It happened with me too. Initially I loved rhyming, but now I like Acrostic, Alliterative, Enclosed rhyme, Glossa etc. Inspiration is from within. I enjoy other’s creativity and their expressions, but my creativity comes from within and maybe that’s why I was being able to write on 50 forms of poetry creating a few of my own. If I would have been falling in the trap of favoritism with regards to poetry forms in my early time, I wouldn’t have been able to learn these amazing forms and let me remind you there are still more to learn. My English teacher during my 9th class, the dean of my college during my master’s and an established writer as of today has the pivotal role in my creative growth. Their encouragement and critical eye give me insight about my work and help me to grow stronger with time. I am still in search of my type. I believe right now I am in a learning mode. Learning different forms of poetry, illustrated different writing styles, then reading different writers also takes you towards different writing styles. So I am learning as of now, it’s too early for me to say that I am in a specific writing zone. A rough idea is always there about the work, but I give myself freedom to change between. It happens at times that you don’t believe in your abilities, but when you reach the middle of the project, you realize the possible turning points. I keep space for the changes too. Definitely not a specific time or place. I mostly write on my laptop and hence in that sense I might say that I have a fixed place (my laptop), but at times I write on my notebook or pages available or even on my mobile at times. An idea can strike you anywhere and hence the place is not fixed, the territory of idea could be. One thing is for sure, I write every day. I know that good writing or best writing is a misnomer for a writer. More you will write, more ideas will pop up, more depth will emerge in your thinking and hence you’ll refine yourself. So I write every day. Sir Ken Robinson is my favorite writer as well as a thinker. His thoughts on creativity in children or adults and his books Out of our minds and The Element are just out of this world. How accurately, he points out the creative element in everyone is astonishing. The second one is Bhagwat Geeta. This book isn’t easy to understand in the first read, it takes a lot of introspection and understanding to relate to the subject matter. It makes you think much deeper than we can even think about. Coming to fiction Shiva Trilogy by Amish Tripathi is another amazing set of books. On this planet earth, hovering around with freedom! On a serious note, I would like to see myself as a very well known personality in writing field. May be I don’t have to tell people my name or even if I have to, then their next question should be – ‘So what are you writing now?’ or in short, I would like to see me as thinking of another idea of writing a new book. I haven’t thought about this as of now. With frequent mood swings and different things happening around me, I might cover all pleasant and unpleasant subjects. As per sales it’s the backbone and as per quality readers it is oxygen. Marketing has become an integral part of the computer age. We see countless ads taking toll on our pockets. For the publishing industry, it is same. Readers will come to know about you only when you get marketed. There are numerous publishers around who publish your books, but their market penetration is extremely low. The advent of paid publishing is also because of this aspect. Without marketing, readers will not come to know about your book and hence your dream will come to a halt. Even a new enthusiastic reader reads a book which makes waves in twitter or Facebook or news nowadays and if that book is making waves without any marketing help then I think I need to take a break. Keep writing and have perseverance. Write because you love to write and not because you have to gain anything from it. Once you accept poetry as your passion, as your integral part of life, poetry will nurture the depth and fineness of your thoughts and you will become a better human being as well as a better writer. So keep on writing, enjoy different forms of writings to understand its depth. That’s how I came up with ‘Poetry for Everyone-1 & 2’ containing 50 forms of English poetry. Enjoy life to the fullest, but keep your feet on the ground. You may want independence, but with it come responsibilities. If you want to enjoy the freedom, be responsible for the quality of it. Thank You Diwakar for being a part of Newbie Corner! Wishing you the very best in your future creative endeavors and life. Today on 'On Writing', the author interview series where authors talks about their writing process, we have Usha Narayanan. Starting off with a gold medal in English from the University of Madras, and two Masters degrees – Usha Narayanan took off like a magpie, collecting more bling. 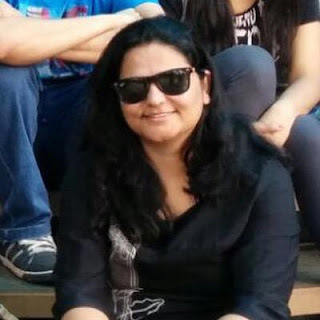 She was creative director in advertising agencies like RK Swamy/BBDO, one of India’s top ten, and in Radio City 91.1 FM. She managed corporate communications and CSR activities in Scope International, Standard Chartered Bank. Usha has lived for the most part in Chennai (Madras), and in Honolulu, Hawaii where she did a writing course. She loves reading, travel and animals and has two opinionated cats. 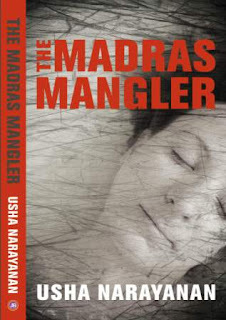 The Madras Mangler, a suspense thriller, received excellent reviews (read here). Her second novel, a fantasy thriller, Pradyumna: Son of Krishna is available in leading bookstores and online at Amazon, Infibeam and Flipkart (also as eBook). 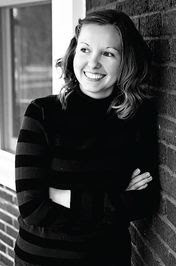 Her next is Love, Lies and Layoffs, a romcom published by Harlequin – HarperCollins (Sep 2015). 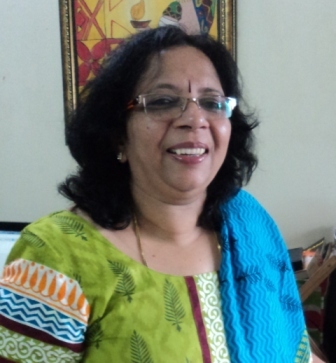 Welcome to ‘On Writing’ Usha Narayanan. 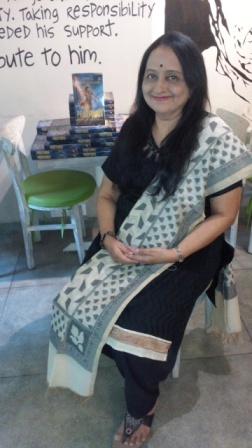 Mythology is a very popular genre in India right now but it is also the most difficult genre to write in. Do you agree with this statement? Yes, that is right. There are already so many books out there, so you must be careful and choose an untold story or take a new angle on an old story. You must immerse yourself in the times and the milieu you are writing about and make sure that every detail is true to that context. This means setting, clothes, living conditions, language, even names that you invent. And when you are imagining some parts of the story to fill in gaps, you must ensure that these are integrated with the rest, so that the reader cannot discern which is which. Finally, as the richness of our myths springs from the wisdom of our ancients, you must make sure that you embed a deeper layer of meaning, an inspiring philosophy distilled from our scriptures and our unique heritage. Sometimes I start off with the characters, hearing them speak, fight, love and dream. My protagonists are usually youngsters setting out on their own, individual quest. This mission could be as simple as being happy and successful in life, or as huge as Pradyumna’s where he takes on his inner demons as well as monstrous beings in order to save the world. Where does life take these brave heroes and heroines? What are the challenges they must face? The answers to these questions determine my plotline. With ‘The Madras Mangler’, I journeyed alongside my five pretty girls; I laughed and cried and grew with them. With ‘Pradyumna’ it was a gigantic canvas peopled by gods and demons, animated by magic and mystery. Hence, I put down a complex outline to ensure that the action, adventure, romance and divinity were perfectly blended and that the climax would be a wake-up call to humanity. I then filled it up with colour and action so that it evolved into a spine-tingling, yet transformative narrative. What makes ‘Pradyumna: Son of Krishna,’ different when compared to other mythological books currently in the market? One, he is one of our unsung heroes, lost in the shadow of his great father. So, everyone is eager to find out about him. Two, the book is chock-a-block with fascinating stories that enthrall people aged ten to eighty. Three, it offers the reader a thrilling ride, with captivating characters and a fast-paced plot, with an underlying thread of heroism, spirituality and wisdom. Four, it inspires us with a message that is ancient yet contemporary, something that we can use in our own lives. Your book has already entered the Nielsen’s list of best sellers. Congratulations on that. How important do you think marketing is to make a book popular? I know that Pradyumna has been mentioned in mythology as Krishna’s son. Krishna’s stories are very popular and most of us adore Krishna. But like most of the readers, I know very little about Pradyumna. How did you create a character like that and succeed in doing that? I didn’t know anything of him either; neither did elders in the family who are familiar with our lore. That challenged me to look for even a passing mention of Pradyumna online and in books in different languages. Then I blended mythology with imagination to come up with my own hero ―someone who is very much like us, battling his own weaknesses, trying to take on a world that is increasingly cruel and corrupt. And judging by reader reviews and the way ‘Pradyumna: Son of Krishna’ is climbing the bestseller charts, I think my hero has inspired others just as much as he inspired me! What made you decide to become a full time writer? What other works are you currently working on? Boredom with the job I was doing, weariness with the long commute, a desire to do something where I was answerable only to myself. Plus a yen to take a perhaps suicidal leap into unknown territory to do something I am passionate about! Slowly my book consumed me. I started turning down even freelance assignments until one day I found myself – voila! – a full-time author. My next is a romcom, coming out soon – ‘Love, Lies and Layoffs’ – published by Harlequin-HarperCollins. It’s a wickedly funny yet heartwarming tale of love and life, and about finding love in the midst of office power play and politics. After that comes the thrilling sequel to ‘Pradyumna: Son of God’, where you will encounter Vishnu’s chakra and Shiva’s trident, and journey with our hero to Yamaloka and Kailasa! Did you approach the publisher directly or through agents? Penguin is your publisher. 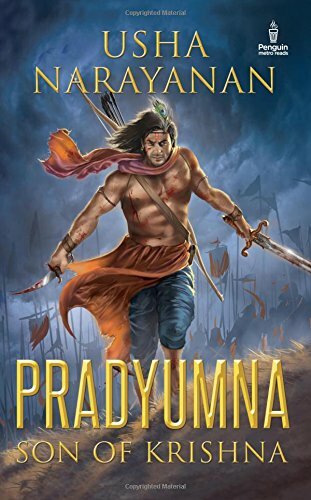 How long was the entire publishing time for ‘Pradyumna’ right from the querying stage? I do not have an agent and submit my query to publishers online through their submission id. Surprisingly, the publishing process with Penguin took less than a year! Executive Editor Vaishali Mathur, who has been an amazing partner in the whole process, is warm, totally involved and unflagging in her support. 1) Be prepared to pour out your soul onto paper and know that this enterprise will consume a huge amount of your time and energy. 2) Polish and perfect what you have written till it’s the best you can make it. Take the help of good writers and readers to edit it. Remember that nothing puts off an editor as much as poor English and a lazy plot riddled with inaccuracies. 3) Persevere. Don’t let rejections kill your spirit. Remember the success that followed rejection of even bestselling authors like Amish and J K Rowling. Thank you so much Usha for the interesting answers. It was an honor having you on ‘On Writing’. Wishing you all success for all your future endeavors! Please share your comments with her by writing to author@ushanarayanan.com. She would love to hear from you. Newbie Corner is that cosy corner on my blog where I talk to newbie authors regarding their passion, their inspirations and their book. You can ask your questions to them in the comments and they will reply to your questions. Welcome to ‘Newbie corner’ Kritika. Tell us a little about yourself. I am an enthusiast writer, researcher and a wife. I like to write fiction, poems, reviews and self-help tips. I have recently started writing a blog which caters to all the topics. Outside of my little writing bubble I am a Senior Manager in Nielsen India. You are coming out with your debut novel, a romance. How different is it from other books currently in market? 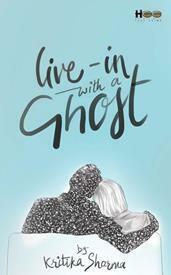 My upcoming book’s title is ‘Live-in with a Ghost’, which is being published by ‘Half Baked Beans’ publishers. 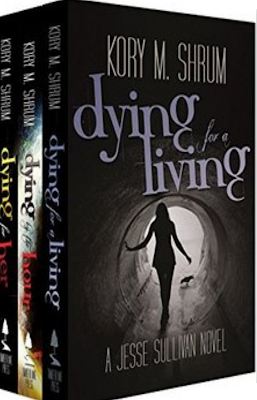 It’s a love story that is about a woman who finds herself in the midst of supernatural. She not only accepts it in her life but also falls in love with him. The way I find it different is how love evolves in midst of crisis. Unlike every other love story we read, my book offers something unique, which simply gels into a love story. How long did it take for you to complete writing it? What is the target audience? The target audience is anyone who likes to read a romantic love story. If I have to quote an age, it would be anyone of 15+ age. What kind of a writer are you? Do you plot the entire novel or make it up as you write. How do you manage your work and your passion for writing? Do you have a favourite place to write or a scheduled time every day? Honestly, it’s not easy. My work requires at least 10 hours constant attention, but writing de-stresses me so I always find time to write something, which is usually at night. Many times I am up all night just to satiate my hunger to write. Who are your favourite authors and what is the genre that you like reading most? My first ever book was “Harry Potter” and it left a mark on me. J.K. Rowling is my all-time favourite author. Apart from her I like to read books from Indian authors (especially new authors), the story they have is usually very interesting. I normally like to read love story and fantasy. Tell us which part of the process of creating a book bothers you? The writing part, editing it, querying, publishing or the marketing part? You are associated with Nielsen. Can you tell us a little about it? What is the message that you want to convey to the readers through your book? There are basically two messages - firstly, love can happen anywhere in any form. We should accept it fearlessly. And secondly, no matter what happens, love always finds it way. When is your book going to be released? How does it feel to finally see your dream fulfilled? The book is to come out by September end. It is being published by Half Baked Beans publisher. Really excited to see it and feel it. 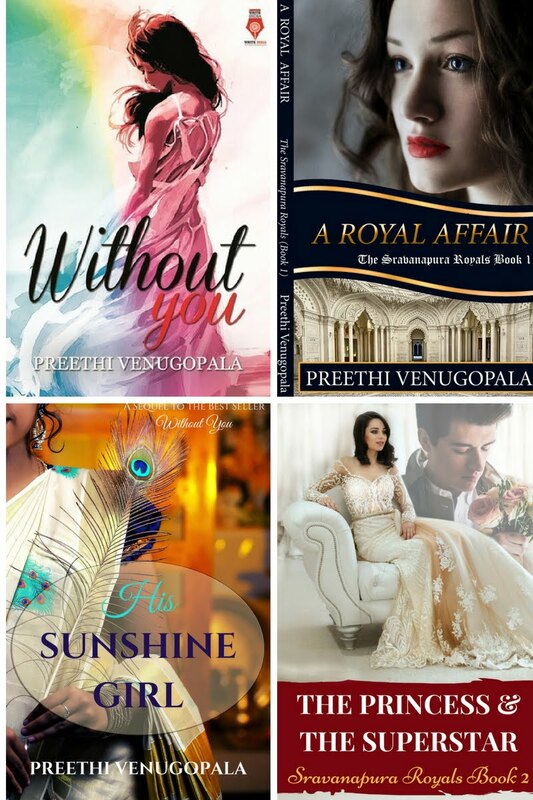 Thank you Krittika for being my guest at Newbie Corner. All the best to your book and writing career. Folks, do buy her book and encourage this promising newbie author. 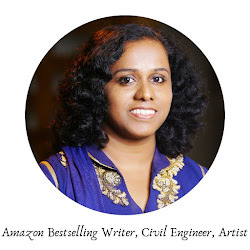 Today we have as our guest on ‘On Writing’, the talented and prolific author Sundari Venkatraman whose books can be found dancing around in the top 100 best sellers on Amazon kindle eBooks. Welcome to ‘On Writing’, Sundari. 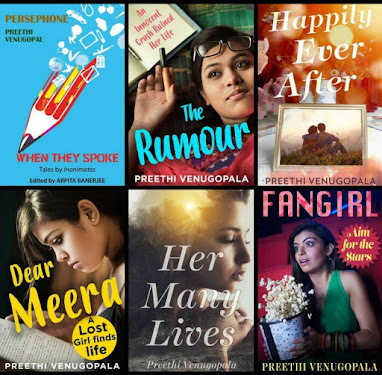 Thank you so much Preethi for giving me this opportunity to answer your questions on the “On Writing” series. I have read that you were a bibliophile from childhood. While reading books, did you ever envision yourself as an author of one of such books? Sundari: Yeah, I always loved reading, my earliest memory being at around three years of age. Of course, I had the advantage of having no distractions such as TV, internet and smart phones in those days. To answer your question, I never thought of writing till I was forty. Something opened up suddenly and I began writing after that. ‘The Madras Affair’ is your first traditionally published book. Your self-published books are constantly among the best sellers on Amazon and you have quite a fan following there. What difference do you think exists in being a traditionally published author and a self published one? 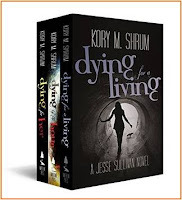 Sundari: Yeah, I have three novels; one anthology and a Box Set self-published under the banner “Flaming Sun”. For those, I had to do all the work by myself. Getting the cover done, ensuring that the editing and proofing was perfect – and that’s important, even when you engage someone else to do it; formatting the book and marketing – I was totally on my own. Though it appears difficult in the beginning, one gets used to it and at the end of the day, the royalty is truly worth it. You get paid more, sooner. And even better was that I could publish four books in the span of one year. The best part of Traditional Publishing, for me, is the printed version of the book. I still think the Indian market is exploring eBooks and most of us prefer paperbacks over e-version. Here, of course, everything takes time as one needs to co-ordinate with a publisher and an editor. The advantage is that there are more heads thinking about the logical flow of the story and more. I must say though that The Madras Affair has not changed all that much story-wise since when I first wrote it. Yes, the manuscript has been tightened and reads crisper than before. And though I participated enthusiastically in ideating the cover, I didn’t have to do it all alone. The joy at the end of it all was holding the printed version of my book in my hands. One other major difference is that it took six months for my book to be published. 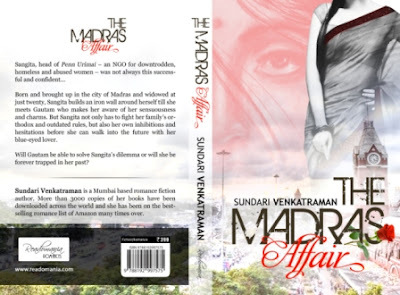 Do tell our readers why they should read ‘The Madras Affair’? What is special about it? How long did it take to complete writing it? 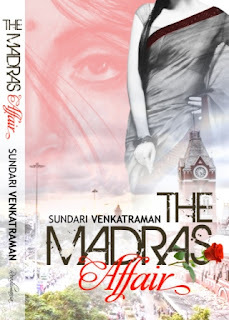 Sundari: The Madras Affair is predominantly a romance-drama. It also happens to highlight a couple of social issues. I am not attempting to teach people how to deal with their troubles or how to transform. The story portrays the life of Sangita, who’s had a miserable life until she meets Gautam. Even then, it’s not exactly smooth sailing as they are from totally different backgrounds. If you like reading love stories with a happy ending along with a lot of sizzling chemistry and family drama thrown in, then this book is for you. I took 5-6 months to write the first draft that was 92,000 words long. That was in 2001. The final paperback has a length of 80,000 words. I loved reading ‘The Madras Affair’. You have brought the characters to life. Did you base them on characters that you know in real life? They do seem real. Sundari: Thank you so much Preethi. I am so glad you enjoyed reading my book. No, I don’t know any specific character who is part of the book. You hear about a lot of people, you read about many. Then there are many incidents that impact your life, even without your being aware of it. The story kind of came out in a flow. I have dedicated this book to my best friend Pooja Gursingh and her husband Mukesh, who is someone I have never met. She was widowed after one and a half years of marriage. The idea of writing about a young widow got triggered a couple of years after I met her. Just the idea; no other resemblance to a real person. Do you get Writer’s block ever? What do you do then? You are one prolific author. Do you have a fixed writing schedule? What is your favorite time for writing? Sundari: I don’t write every day. Most of the time, I write when I feel a story pushing forth from within me, insisting on having its say. Otherwise, if I feel I have a story idea that needs to be fleshed out, I write the outline on an excel sheet; create the character sketches with names, etc. I write when the mood takes. What is the best review you have received so far for ‘The Madras Affair’? You are a bestselling romance author. What is the best thing about writing romance? Sundari: I have my head up there in the clouds and believe in “Happily Ever Afters”. That’s the only kind of book I want to read – the ones with happy endings. The same with writing romance – I want my readers to feel happy when they reach the end of the story. When I create the protagonists, I enjoy the challenge of their crossing the hurdles of human relationships and finding each other. I like creating strong-willed heroines and chivalrous heroes. What is your best marketing strategy? How important do you think marketing is for a book to be successful? Sundari: Best marketing is done via social media, which mostly is free. Yes, it takes quite a bit of effort and time while the reach is to one sector of audience. But then, it’s perfect for promoting ebooks. Though many feel that writing should be the primary concern of the author, I think marketing is also a very important component. To begin with, I know my book best; as well as the back of my hand if not better. Who best to promote it other than me? With so many books hitting the market every day, how will the reader know that my book exists? Marketing is very important to let people know that such a book is there for them to read. I have written a couple of articles on social media marketing. You are welcome to share them with your audience. Sundari: 1) Keep writing; daily if you can. Even writing 200-500 words a day is good practice. 2) Read a lot; especially in the language you want to write in. 3) Whichever language you wish to write in, stay true to it. Ensure you know the language well for it to be possible for you to use idioms, metaphors and the like. Thank You Sundari. I am sure our readers have a lot of information to take back after reading this post. Wishing you the very best for all future endeavors. 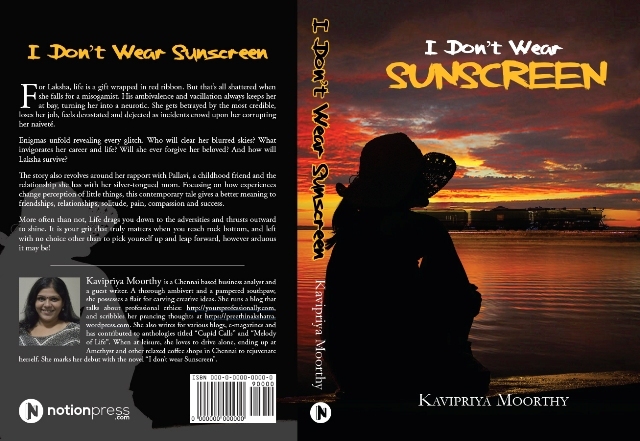 So if you wish to buy her latest book, click the links below. 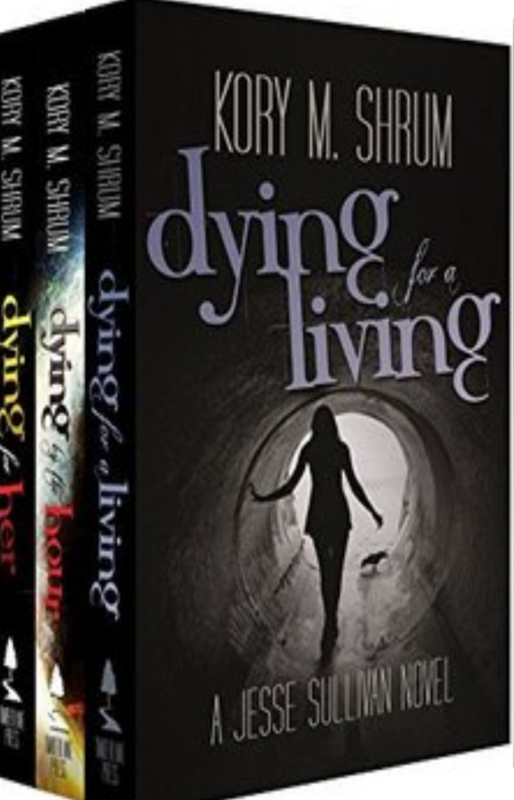 If you have already read her books, review it on Goodreads, Flipkart or Amazon. She would love to hear from you.